Custom Dynamics® Turn Signal Eliminator Kit hit the market earlier this year. Already, it has gained popularity among H-D™ Touring owners. It’s no secret that bikers love their rides, especially when they can make them their own! The light-weight aluminum radius license plate replaces the stock rear turn signal bar. In turn, the kit creates new possibilities for a sleek, clean looking application. The design concept was to remove the turn signal arm bar on H-D™ Touring models, but in a hassle-free way. 2014-2019 Road King models especially needed a way to clean up the bulky, pancake-style turn signals that come stock. With the turn signal arm bar gone, these bikes could use our ProBEAM® Fillerz®, a very popular product for H-D™ Touring models! As you can see below, with the turn signal arm bar still in place, the ProBEAM® Fillerz® wouldn’t be very visible at all. Up until now, the only way to achieve this kind of look was with custom fabrication and lots of know-how. Now, the plug and play application is a job for almost any weekend wrencher! Step by step instructions for the plug and play Turn Signal Eliminator Kit are provided and can also be reviewed online, here. The turn signal arm bar provides the license plate illumination for many bikes. With it gone, we needed a way to light up the license plate. So, included in the kit is our LED illuminated radius plate frame in gloss black or chrome finish. The installation is a simple 2-wire hook up and we back the LEDs with our Lifetime LED Warranty. Mounting hardware is also included in the kit. With the turn signal arm bar gone, the bike has a very custom looking rear fender. But, the bike is also left without rear turn signals! This is where customers can customize the look of their bike even further. Many of the most popular Custom Dynamics® LED products work as the rear turn signals. Fill the void in your saddlebag support rails with our ProBEAM® Fillerz™! ProBEAM® Fillerz® have been engineered from the ground up using the highest quality automotive LEDs and modern light pipe design! Custom Dynamics® premium line of aftermarket LED Fillerz® now provide increased visibility with full contrast brake to maximize safety through modern technology for Harley-Davidson® motorcycles. Plasma Rods™ use a patented technology to produce a seamless, unmatched LED brightness, unlike anything you’ve seen. Custom Dynamics® Plasma Rods™ can be used almost anywhere; most commonly, between the bike’s fender and saddle bags as an additional run, brake or turn signal. Single Color Red or Dual-Color Red/Amber. Available in 8”, 10”, 12” and 14” lengths – perfect for custom baggers! 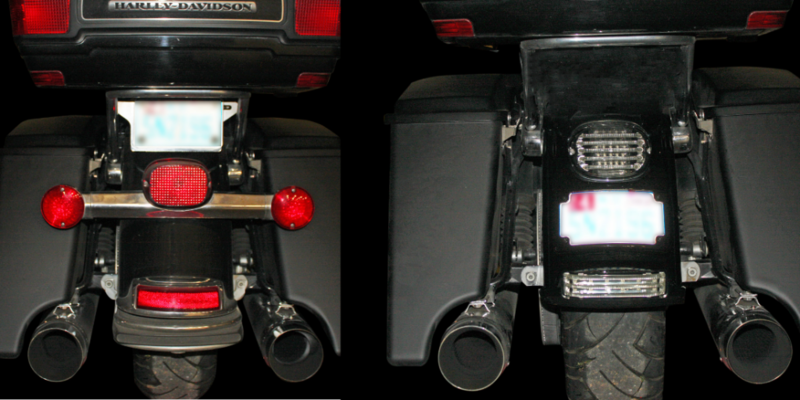 Looking for a slim, custom looking bag light for your new custom looking rear fender? You’re in luck! Low Profile BAGZ™ have been designed with a sleek low-profile design. Utilizing super bright red LEDs behind a red or smoked lens, the Low Profile BAGZ™ provide dual intensity rear function to the OEM Harley-Davidson® hard saddlebags. Low Profile BAGZ™ come pre-taped and include a plug and play wiring adapter for an effortless install and easy removal of the saddlebags. Available in plug & play configuration for Run/Brake, Run/Turn or Run/Brake/Turn function depending on model. Or, for a more robust looking saddlebag light, you can increase your visibility and safety on the road with BAGZ™ Saddle Bag Lights for H-D™ (OEM) Saddle Bags! Available in Chrome or Gloss Black Finish with either a Red or Smoke lens; each unit offers 86 Super Bright Dual Intensity Red LEDs – sure to get you noticed for all the right reasons! Upgrade to the Sequential plug & play configuration for Run/Brake function with Sequential Red Turn Signal – no additional modules required! Also stay tuned for our ProBEAM® BAGZ™ which have been highly anticipated – due out later this month! 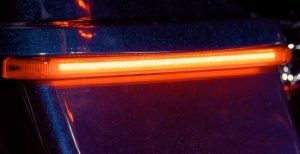 ProBEAM® BAGZ™ will match perfectly with your other ProBEAM® accessories like ProBEAM® Fillerz®, ProBEAM® LED Taillights and the ProBEAM® Rear LED Wrap Around Fender Tip! With a light pipe design and full contrast brake, you’ll be able to increase your visibility while maintaining a modern, sleek look! For more information on any of the products mentioned here, call Custom Dynamics® or contact your local Drag Specialties dealer! SHOP CUSTOM DYNAMICS® TURN SIGNAL ELIMINATOR KIT!